On December 10, 2012, autonomous hovercraft took over the Kim Building rotunda once again during the final of ENES100, "Introduction to Engineering Design." In what is now a semester-end tradition, teams of freshmen launched their colorful, hand-built vehicles, each floating on a cushion of air, to find their way around, and out of, a walled track, while capturing a payload placed on a pedestal on the track. Eighteen teams qualified for the final round of competition. 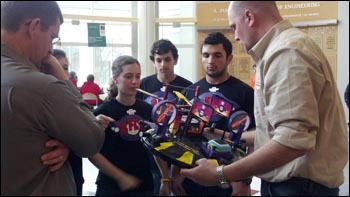 Out of those, four teams completed the course successfully, led by Team Keystone Flight. The award for most innovative design went to Team Leviosa, while the award for best craftsmanship went to Team 2Fly, which consisted of students from Walter Johnson High School in Montgomery County, Md.